International forwards, John Cleary and Jim Paterson were sent from the field by Sydney referee, Laurie Bruyeres in the Foley Shield Grand Final in Townsville, played in front of a raucous crowd of 10,000. Bruyeres awarded seven penalties and issued four cautions in the first eight minutes of the match, won 30-8 by Innisfail against Townsville, with the home side’s points coming from four penalty goals by Brian Bevan (not to be confused with Brian Bevan from Warrington in England) in the first 25 minutes, when things were tight. Townsville’s dual international, Cleary was dismissed after a blow-up with Innisfail’s classy state centre, Ron Tait. Paterson was sent off two minutes later after he had tackled an Innisfail player already held by a Townsville defender. Wouldn’t be a problem now. Paterson refused to leave the field, and Bruyeres called North Queensland president, Jack Tracey on to the field, but sanity prevailed and Paterson trudged off before Tracey’s diplomatic skills were put to the test. With both sides reduced to 12 men, Innisfail’s superior pace out wide exposed Townsville. Jim Foreman was the pick of the Innisfail forwards, while fullback, Bill Sevdalis scored two tries. Innisfail halfback, Ross Goodman was named player of the 1964 Foley Shield season. After the match a North Queensland side was chosen to play Brisbane in a State championship match, and the northerners romped home 20-8 at Lang Park, with Jim Paterson and Cairns’ lock, Stan Williams leading the way. Tully banana farmer, Danny Clifford also excelled for the Northerners, in a match sponsored by The Courier-Mail. The NQ team was: Brian Walsh (Herbert River); Lionel Williamson (Innisfail), Alan Gil (Cairns), Gary Wellington (Ayr), Don Jago (Cairns); Ron Tait (Innisfail), Ross Goodman (Innisfail); Stan Williams (Eacham), Angelo Crema (Tully), Jim Paterson (Townsville), Danny Clifford (Tully), Reg Webster (Ayr), Alan Lewis (Cairns). Res: Sid Clarke (Townsville), Gordon Cogill (Mackay), Barry Dowling (Herbert River), Brian O’Farrell (Eacham). Norths had beaten Brothers 13-4 in the Brisbane club grand final, the Devils’ fifth premiership in a row under the coaching of Bob Bax. The crowd was 21,000, a record. Only 9,000 turned out for the state championship match. 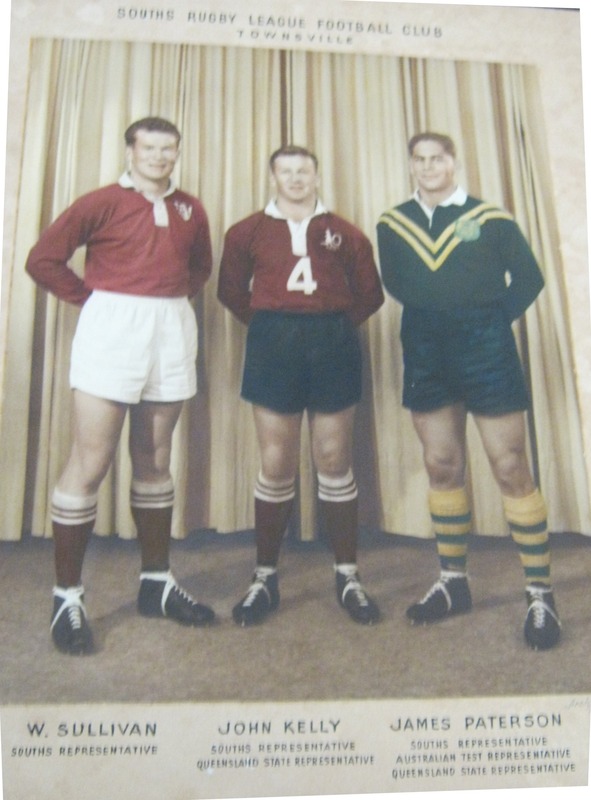 Townsville Souths league identities, Bill Sullivan, John Kelly and Jim Paterson. Paterson was sent off in the 1964 Foley Shield Final.